Founded in 1994, IOI stands for “Input/Output Interfaces”. IOI provides high-speed and cost effective I/O solutions using the Gigabit Ethernet, 1394 technology, USB (Universal Serial Bus), Serial ATA and PCIe Expansion standards. IOI aims to become the first tier of I/O solution supplier in Taiwan. “Your I/O Solution Provider” is the slogan of IOI. EPCIEX4D01E is an external PCIe x4 to PCIe x8 (x4 mode) Slot Docking Enclosure. 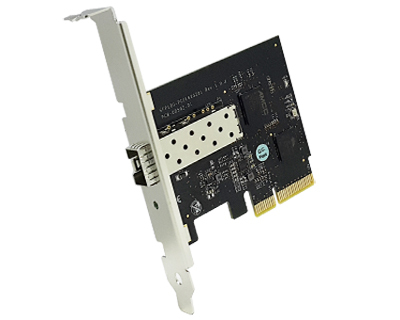 The EPCIEX4D01E expands PCI Express connectivity from your desktop computer, enabling seamless, high performance, and reliable control of remote PCIe device. No additional software or drivers are needed – the remote devices operate as if they were directly installed in your computer. Designed to overcome the limited PCIe connectivity of most desktop computers, the EPCIEX4D01E can be quickly and easily set up for multi-I/O, high throughput, or hazardous applications. In particularly rugged environments, your desktop computer can be placed at a secure location up to 7 meters (for PCIe Gen 1.0) or 100 meters (with PCIe A.O.C) away. High performance and reliable communication is maintained with the well-shielded extension cable or A.O.C (Active Optical Cable), and the docking station is designed to withstand high or low temperatures, vibrations and shocks. In addition, the isolation between core components and docked PCIe devices eliminates any possible electromagnetic interference between them. This Application includes a PCIe Cable Adapter Card, a robust Docking Enclosure (EPCIEX4D01), and a PCIe Cable. 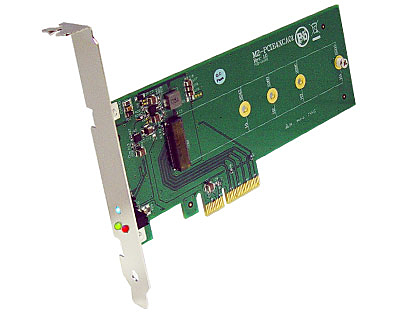 The PCIe Cable Adapter Card fits into a PCIe slot (x4, x8 or x16) in the host computer and communicates to PCIe x4 device installed in the docking station. If you need more USB ports for long distances, you can install USB 3.0 host card on the EPCIEX4D01E and it can be placed up to 100 meters by PCIe AOC. 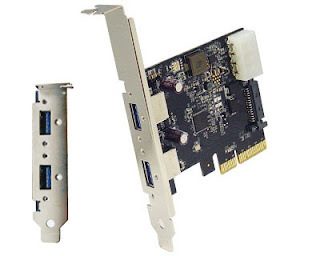 U3-PCIE2XG221 is a 2-port USB 3.1 to PCI Express x4 (x2 mode) Gen 2 Host Card. The U3-PCIE2XG221 is an Universal Serial Bus 3.1 host controller, compliant with Intel eXtensible Hot Controller Interface specification revision 1.1, bridging PCI Express interface to two ports of USB3.1, up to 10Gbps high speed bandwidth, backward compatible with legacy USB function and devices. It can configure as PCIe x2 Gen2 or x1 Gen3, compliant with UASP (USB Attach SCSI Protocol) Revision 1.0, supporting the XHCI debug capability. The design supplies normal core power and suspend core power, supporting the driver on Windows 7, Windows 8.0, Windows 8.1 and various Linux Kernels. SFP10G-PCIE4XG201 is 10 Gigabit Ethernet SFP+ to PCI Express x4 Gen 2 Host Card . The SFP10G-PCIE4XG201 complies with common 10GbE SFP+ optical & Direct Attached Copper modules. With only 4.12 Watts maximum power consumption (including the optical module in full duplex), the SFP10G-PCIE4XG201 offers the lowest power consumption and the best cost solution in the market today. Targeted at high-end Workstations and low cost Application Servers, which seek to service the increasing demand of higher network bandwidth, while maintaining low power and cost budgets. The 1394b Long-Haul Active Cable (CB-00539) integrated two coax transceivers and is designed to simultaneously transmit and receive signals on a single 75Ω coax cable, extending your signal an additional 20 or 40 meters. It's easy to setup and there is no configuration necessary, like all IEEE1394 compliant hardware. The 1394b Long-Haul Active Cable (CB-00539) is ideally suited for IEEE 1394b-2002 connections over 75Ω coax cable at S800 data rate as specified in the 1394 TA Baseband Coax PMD Specification. It can also be used at S400, S200 and S100 data rates. The 1394b Active Cable connects seamlessly to any IEEE 1394b-2002 compliant physical layer controller (PHY). For correct operation the signals must be NRZ (non-return-to-zero) encoded, DC balanced with a maximum run length of 10 bits, and have a speed (edge rate) of between 100Mbps and 1.25Gbps. This 1394b Long-Haul Active Cable (CB-00539) is useful and economical solution for the Machine Vision, Surveillance and FireWire Storage market. Four downstream ports USB 3.0 HUB (3.5" FDD Form Factor) w/USB Battery Charging Specification Revision 1.2 for Charging Downstream Ports (CDP). Supports USB Battery Charging Specification Revision 1.2 for Charging Downstream Ports (CDP). Some popular phone models are not compliant to the BC1.2 specification and fail to establish a data connection. These phones use primary detection to only identify ports as SDP (data / no charge) or DCP (no data / charge). They do not recognize CDP (data /charge) ports. When connected to a CDP port, these phones classify the port as a DCP and will only charge. Since charging ports are configured as CDP when the computer is in S0, users do not get the expected data connection. IOI Technology Corp.. Travel theme. Powered by Blogger.